Amazingly we had yet another completely sunny day although it had snowed during the night and took a while to clear. 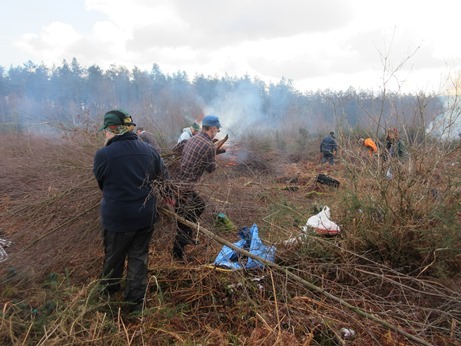 A large group of us continued the birch clearing and enjoyed the good weather. 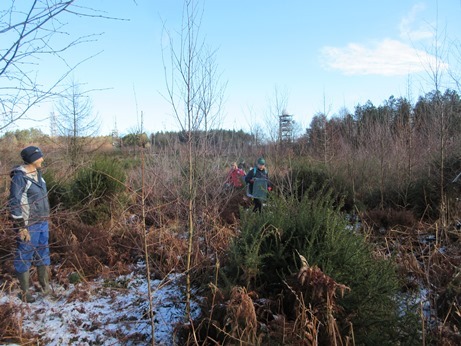 The snow is still on the ground as the team travel across the heathland to start the removal of the birch and herbicide spraying. Dragging the cut trees towards the fire. The ground here is really quite treacherous as there are many ditches and small pools to navigate around. So... is this a finch nest? 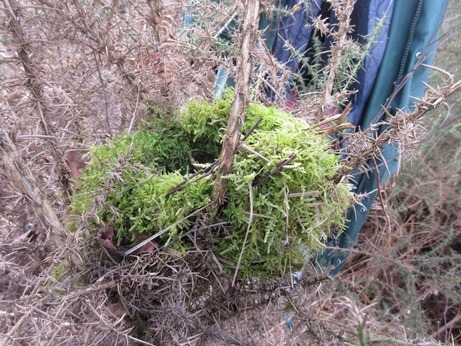 It is one of last year's nests, about two feet above the ground in a gorse bush. This means that it is not from a ground nesting bird or a tree nester. It could be a Chaffinch or a Greenfinch or even a Bullfinch. What was amazing was that the moss surrounding the nest was bright green and alive.